Late, and now REAL late, filing ! There has been a lot of speculation surrounding the missing 2nd quarter report from IC Places, Inc. The CEO, Mr. Steven Samblis is, as usual, not providing any details on it’s whereabouts, or, when investors might expect it to be filed – if ever. This of course leaves investors to wonder and speculate on the “why” behind the late/missing report. Meadow2009, a poster on Investors Hub, as usual, has introduced some very compelling theories as to why the report may be late. Several of Meadow’s theories involve speculations regarding the new accounting firm, Hartley Moore Accountancy Corporation, and their review of IC Places, Inc.prior to creating the report. Meadow speculates that the new firm may be taking extra time to thoroughly review IC Places, Inc., and all their related financial activities. Although Meadow’s theory may be accurate, may we suggest another theory… namely Mr. Samblis is broke and can no longer afford to endure the costs of preparing these reports. Not only the normal cost of preparing the report, but as Meadow suggests, the new accountancy firm may be requiring more fees because of the more extensive review that should be done in order for the new firm to sign off on the report. I am reminded of the principle – Occam’s Razor… to paraphrase, the theory with the least assumptions is likely the most accurate, i.e. the simplest explanation is usually the best. One needs to remember some history here. In this recent post we outlined some thoughts about the Hartley Moore Accountancy Corporation announcement. It’s worth a read, or re-read if you have already seen it. In this post we remind readers that Mr. Samblis now has some history regarding terminations within the company, namely the previous president. You may also be reminded that Mr. Steven Samblis has a documented history of making grandiose press releases, only to find out later that the information put forth in the press release wasn’t worth the paper it was printed on. Many, and some would say all, of those press releases turned out to be misrepresentations, and/or failures. Some would say that Mr. Samblis simply puts out the press release in an attempt to move stock for his financiers, with no intention of following through on the subject of the press release. So… could the Hartley Moore Accountancy Corporation announcement have been simply another failed or fraudulent effort to mislead investors into thinking Mr. Steven Samblis was moving forward with the rebuilding of the company? Given that there have been documented situations, namely the past president’s “firing”, which documents would support, turned out to be a gross misrepresentation at best, and, previous press releases announcing shows and initiatives that failed to materialize… it would be easy to conclude that the press release about Hartley Moore was nothing more than smoke and mirrors, and that it is unlikely they are working on anything for Mr. Samblis. Although they may have been “engaged” to do work, it is unlikely they will actually do any work until paid. If they have followed any of the readily available information about Mr. Samblis and his Company, IC Places, Inc., perhaps they are requesting payment in advance. Also, it is a viable theory that Mr. Samblis is broke. At least broke in the terms that he previously was accustomed to. There was a time when the PPS of the stock was over a penny, and it was easy to pledge shares to the likes of Asher to acquire operating funds, and to fund his personal expenses. However, of late, the PPS is in the dumper, reverse split after reverse split has failed to breathe new life into the PPS, and, there appears to be a concerted effort by those previously burned by Mr. Samblis to inform any perspective investors of the history of this company and it’s CEO, Mr. Steven Samblis. At some point even Asher will be reluctant to purchase convertibles for fear of not being able to move the shares in the open market in order to make a return on their investment. Asher may have already shown resistance in the form of higher conversion requirements. Increased risk always demands higher initial costs, and there is certainly increased risk with IC Places, Inc. of late. On the subject of operating funds… the above begs the question, what is Mr. Samblis using for operating funds, as well as supporting himself on the personal level. There is a huge controversy over revenue… as in where is it going if there is any. To date, of late, the filings have shown NO revenue. It seems unbelievable, and perhaps fraudulent, that advertising is being shown on Mr. Samblis’s websites, the company is well into the contract with ClearVision, and there is ZERO revenue. Not talking “profit” here, simply talking “revenue”. Many have asked the question… WHERE is the revenue being recorded, because it’s a reasonable assumption that there is in fact some revenue. Seems simply unbelievable that Mr. Samblis works months and years and cannot generate even $1.00 of revenue. Hopefully Mr. Samblis is not doing something illegal with the revenue if there is any. So folks, there you have it. Many, many questions, and no answers from the CEO, Mr. Steven Samblis. From time to time Mr. Samblis posts on the message boards, many say using bogus and misrepresenting aliases, however he chooses to use the time to attack posters and investors (i.e. shoot the messengers) instead of addressing these very important issues. What does that tell you ??? CEO… in true form ! Well folks… did you catch it? You had to be quick because it was deleted quickly, and rightfully so as you will see here just below. 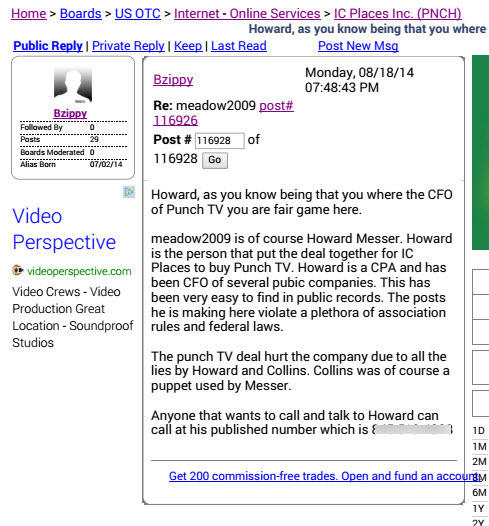 So… you are likely aware Meadow2009 has been peppering Mr. Steven Samblis, CEO of IC Places, Inc (ticker PNCH) with numerous facts excerpted straight from Mr. Samblis’s SEC legal filings. For weeks Meadow2009 had done some outstanding work pulling together facts, and presenting such in a very straightforward manor on Investors Hub. Facts, figures, and straightforward questions about some very serious shortcomings related to Mr. Samblis, and his submission of legal documents to the SEC. Everyone should be thanking Meadow2009 for his efforts. Not that most didn’t know about some of the information provided, but what was amazing was the effort put forth, the extent of information, and the straightforward presentation of such. Now… notice the response. In light of the voluminous amount of information posted by Meadow2009 over the past several weeks… did Mr. Samblis respond to even 1 piece of information put into question by Meadow2009? Meadow2009 probably posted over 50 pieces of information that needed to be addressed by Mr. Samblis… and although Mr. Samblis found the time to reply, and engage in a “shoot the messenger” type response… he couldn’t find the time to address any, not even 1, of the issues raised by Meadow2009. And, not only does Mr. Samblis make attempts to disparage Meadow2009, he then concludes the post with what Mr. Samblis thinks is Meadow2009 personal home phone number. Now the phone number may be valid, may not be valid, that is not the point. The point is… Mr. Samblis, in true form, attempts to divert the reader away from the real issues by attempting to shoot the messenger. Mr. Samblis, it appears, would rather spend time and resources attacking his critics, instead of addressing the issues, and or, resolving the situation that caused the controversy in the first place. Apparently, those that would “dare” to post unflattering information, revealing Mr. Samblis and his shortcomings, are then subjected to ridicule, disrespect, and threatened with legal action. Some would call this “thug” mentality. Apparently Mr. Samblis thinks that by shooting the messenger, it diminishes the information’s value and readers/investors will think less of it and/or forget about it. Here is a post we did on the subject a short time ago, and below is an excerpt from that post. 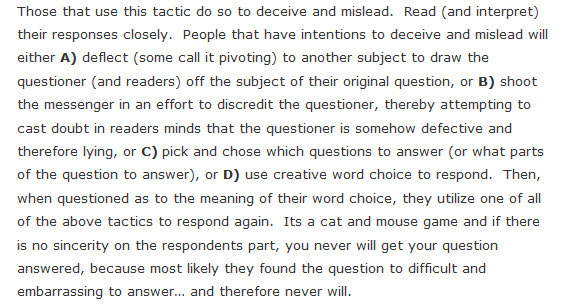 It appears Mr. Samblis hit ALL 4 tactics in how to spot those that intend to deceive. Notice also in the post by Mr. Samblis, his reference to blaming others for the disaster of the IC Places and PunchTV merger. Here is a question for you Mr. Samblis… have you EVER accepted responsibility for anything that went wrong with one of your decisions? The merger/purchase was YOUR decision, right? YOU had the final say on consummating the deal or walking away, right? YOU authorized the expenditure of the investor funds, right? Because you appear to be saying the PunchTV purchase was someone else’s fault. As CEO doesn’t the buck stop with YOU ??? And lastly… isn’t it true irony when Bzippy gets frustrated when he thinks someone appears to use a bogus alias ! WOW… now who would do that ??? Maybe HollywoodFastLane, mighttrade, zurich, or dotd could answer that ! Lions, Tigers, and Bears… Oh my ! Could difficult days be ahead for Mr. Samblis, CEO of IC Places, Inc. (ticker PNCH) ??? This is where it gets interesting, and could cause some difficult days for Mr. Samblis. If you have ever followed high profile prosecutions , you will know that the authorities nab a key figure, like an accountant in the organization, then under the treat of harsh punishment, they cut a deal with the authorities to reduce or eliminate their punishment for rolling over on the principals. This is a smart move of the SEC. It is likely much harder to hold the principals accountable for any wrongdoing because they are insulated somewhat by the people they have work for them. However, get one of them to roll over on the boss, and now its a different ballgame. Now… as the article states, Mr. Messineo has not been accused of any wrongdoing. However, as you know the SEC would not be saying he is a target of their investigation, while it is ongoing. It is well known that the SEC keeps the details of their investigations close to the vest until enforcement action has commenced. So… stay tuned. There was an interesting quote from Mr. Messineo in an Bloomberg article here. “...doesn’t always follow what happens to shell companies after he audits them“. Wow… so is he saying PNCH is a shell company ? This is an interesting quote from the former auditor of PNCH. It seems as though Mr. Messineo has already begun to distance himself from previous companies he audited. One wonders if he has any allegiance to his former boss Mr. Steven Samblis. If put in a squeeze by the authorities… will he maintain any loyalty to Mr. Samblis. One would think he likely knows where any skeletons may be buried. One needs to put this article into perspective with other such recent articles relating the the SEC enhanced enforcement activities of penny-stocks. It would appear the SEC has penny-stocks in their cross-hairs, and if not actively investigating specific companies, its radar of such has been turned up a notch or two. It appears they are getting serious about cleaning up the penny-stock side of the stock market. This will spell bad news for companies that their primary product is selling shares of the company to fund a CEO’s lifestyle. By the way… Mr. Samblis has been unusually quiet on the message boards lately. One has to wonder why. Bueller…. Bueller…. Bueller ? Yes folks that’s right… Mr. Steven Samblis, CEO of IC Places, Inc. files yet another extension to the quarterly reporting. Seems like this is a pattern now also. One thing we did see by the extension, they changed their corporate address (click to enlarge). Here is their new corporate headquarters, nestled right between the CVS Pharmacy, and the detailing shop (courtesy of Google maps). Is that Mr. Samblis’s Yukon there in the parking lot, or is it a detailing job ? Where’s the Bentley? Is this where Mr. Samblis operates the “servers” that power his vast ImaginationTV empire? Is this the hub of all financial activity? This (address listed in the extension) is actually the studios of Empire Media Center, one of IC Places “partners”. There are several pictures of the inside of the Studio on their website, but none of the outside. Is that not a selling point? And, in the picture below, one needs to ask… which of the 2 offices does Mr. Samblis call his? One wonders how he runs the TV and broadcast empire from either of these offices. 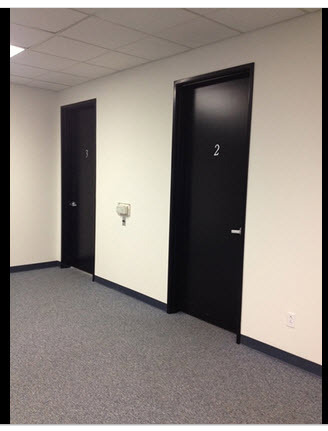 From their website they boast of “2000 square feet of studio space”. That’s about the size of a strip shopping center store. Does that include the detailing shop space also? By looking at the exterior of the building it seems hard to believe this quote from the IC Places press release announcing the partnership. Empire Media Center, located at 3915 San Fernando Rd. Glendale, California features one of LA’s largest permanent green screens which has been used in the production of TV shows, music videos, commercials, and photo shoots. The studios offer full time news sets, fully furnished interview sets, office spaces and large event facilities. We are not sure which office Mr. Samblis occupied at his old address, but at least that location had better curb appeal, AND indoor parking. Oh well… it will be interesting to see what the filing says when it finally gets published. Stay tuned. Mr. Samblis a “victim” ??? So folks… please see the attached post by Mr. Samblis (opps, we mean Bzippy)(click to enlarge). Although it remains to be proven, but for the sake of clarity, it will be assumed here that “Bzippy” IS Mr. Steven Samblis. We have previously commented on ( here ) what many believe is the fraud perpetrated on the investing public by Mr. Samblis using bogus aliases to post hype surrounding his company, and to surreptitiously respond to unflattering comments made about his company. Many believe it is glaringly obvious that Mr. Samblis uses bogus aliases in an attempt to avoid being held accountable for his statements. In his posts, Meadow2009 has cited some very important questions surrounding Mr. Samblis, CEO of IC Place, Inc, and, documented numerous inconsistencies in the SEC Quarterly/Yearly filings of the company. Meadow2009 has done a excellent job at providing facts and figures, as well as what many would describe as some highly educated commentary on the subject of material accounting principles that seem to have been discarded when Mr. Samblis files (or causes to be filed on his behalf), SEC documents purporting to represent an accurate picture of the company’s financial state. Referencing the above graphic, representing Mr. Samblis’s response to Meadow2009’s work/postings… Mr. Samblis appears to play the victim role. In addition to his attempts at playing the victim, he also attempts to subtly shoot the messenger. This is classic avoidance of the issue(s) at hand. Meadow2009 brings numerous facts to the forefront, and Mr. Samblis, instead of addressing the questions, chooses to respond by, in effect saying, that lies can be posted because he is the CEO of a public company i.e. “fair game“. If these issues weren’t so serious, so apparently blatant, and so inexcusable, Mr. Samblis’s attempt at playing the victim would be laughable. However, Mr. Samblis’s apparent disregard for honesty, and disrespect for the SEC is no laughing matter. Mr. Samblis seems to think that if he can draw the readers off the subject matter, and facts, readers will lose sight of the questions he is not answering. Here is an excerpt from one of our previous posts regarding how to easily spot a respondents attempt to deflect focus from unflattering subjects. So… Meadow2009… keep up the good work. Many potential investors will thank you for your efforts at shining a light on the information that Mr. Samblis would apparently like to keep hidden from the investing public’s view. Its likely current (and past) investors will thank you also in bringing to light things they wished they had known prior to losing their hard earned money on this company. And, its likely the SEC will thank you for assembling a lot of the information they will need should they decide to take a closer look at this company. If the SEC wanted to set an example of what NOT to do when running a public company, this might be a good case to pursue. They seemed to have perused other companies for a lot less. ANOTHER failed Press Release ??? Mr. Steven Samblis, CEO or IC Places, Inc. appears to fancy press releases such as the Reed’s announcement to lure new investors into investing in his company. Its been almost 4-months since that press release, and it appears the announcement was misleading at best, fraudulent at worst. How does a company release a formal press release like that and the public never sees anything come from it. We have not seen one add from Reed’s appearing on any of the IC Places, Inc, Imagine TV, Imagination TV, Drivein TV, or any other medium associated with Mr. Steven Samblis. The press release touted Reeds as the “first official launch sponsor” of Imagine TV. Given that Imagine TV has come and gone (no one seem to know why, but some think it was due to copyright infringement with the other Imagine TV’s) and now that Mr. Samblis is promoting Imagination TV, there is still no evidence of this sponsorship. The Reeds press release is but one of many press releases that have never come to fruition. Many would call that a pattern. It would appear that his press releases are just about as reliable as his SEC filings. There are multiple documented instances of misleading and inaccurate information contained within the SEC filings, now it appears Mr. Samblis’s press releases can be added to the pile of misleading and inaccurate documents. Is the most recent press release touting the Uncommon Denominator going to succumb to the same fate as the Reeds announcement ? It follows a long line of previous press releases that seem to have failed, or worse, been simply propaganda aimed at improving the dismal performance of the company’s stock ( PNCH ). Perhaps one or two complete failures of the initiatives touted in previous press releases could be called bad luck, or a coincidence, but seemingly every one ??? Again, many would call that a pattern, and point to the extremely low reliability rate of the information. History can not be changed… and this company, as well as Mr. Steven Samblis, has plenty of history. A simple Google search will support much of the history reported about this company. If you are thinking about investing in this company… even if its just for “flipping”… take 5-minutes and do some research on the company before making any decisions. It could be the best 5-minutes you ever spent. Mr. Steven Samblis… EXPOSED ! Folks… there are some EXCELLENT posts over on Investors Hub that lay out the raw details of what many would call the fraud perpetrated on his investors by Mr. Steve Samblis, CEO of IC Places, Inc. who’s stock ticker is PNCH. Posters Milesblue42 and meadow2009 have posted some very straight forward and significant questions about the IC Places, Inc operation, and calls into question the actions of the CEO Mr. Steven Samblis. A few of the posts are here, here, here, and here, however there are others. Please take a few minutes to review their posts. But the most important aspect of their hard-hitting questions is… there has been NO rebuttal or response from Mr. Samblis. Gentlemen… keep up the good work. Thank you for taking the time to present your questions and thoughts in a straight forward and thoughtful manor. Readers of their posts are reminded that many of their questions rise from the information contained in the SEC public filings. These are legal filings supposedly accurately outlining the IC Places, Inc.’s operations. Filing these documents with the knowledge that the information contained within them is not accurate, and/or the willful omission of information that could significantly affect the health and future of the business that investors deserve to know when making investment decisions, is about as serious as it gets. If in fact this information has been knowingly falsified, (as several important aspects of such have been documented right here in this blog, such as Mr. Samblis’s employment contract, legal proceedings, and the departure of the previous President), Mr. Samblis appears to be thumbing his nose at the enforcement powers of the SEC. And this from a man that has previously been the subject of enforcement action.